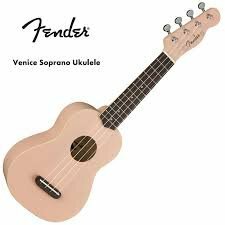 Inspired by the entertaining sights and unique, carefree spirit of Venice, California, Fender created a soprano ukulele that captures its vibe - the Venice Ukulele. Thanks to its compact, comfortable body size, the Venice travels easily from the beach to the studio or jam room while retaining the classic, light sound that made the ukulele a "must-have" for today's players. The slim "C"-shaped neck profile is comfortable to hold and easy to play, while the no-tie bridge makes changing strings a breeze. A stylish bound top and 4-in-line Tele headstock adds a unique dash of Fender style that can't be duplicated.